It was one of those mornings where you open the fridge and stare at it blankly for about 10 minute; contemplating what to start your day off with. This week was ridiculously crazy at work so I knew I wanted a kick-start this morning…full energy breakfast come at me! 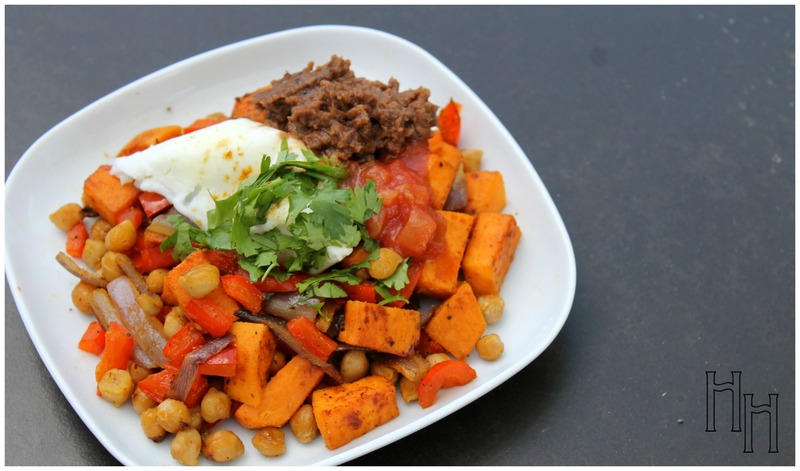 I put this breakie hash together by honestly meandering through my fridge, pantry and spice rack. Try it out! 1. In a sauce pan, heat your coconut oil to a medium/high heat. 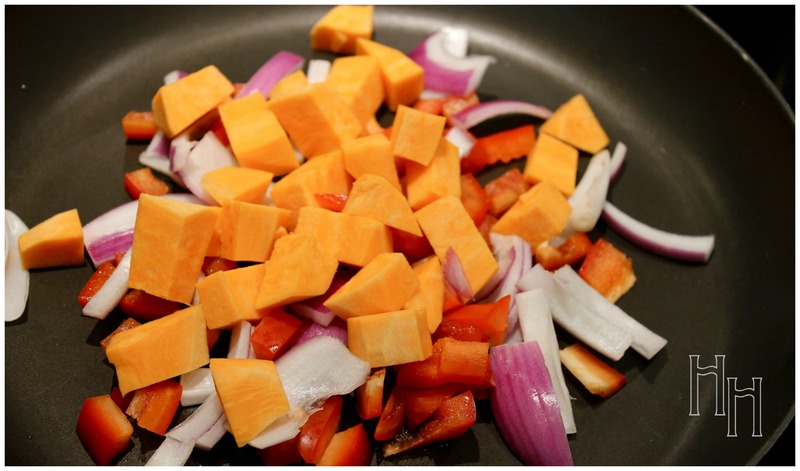 Add your onion, bell pepper and sweet potato, salt, and pepper. 2. 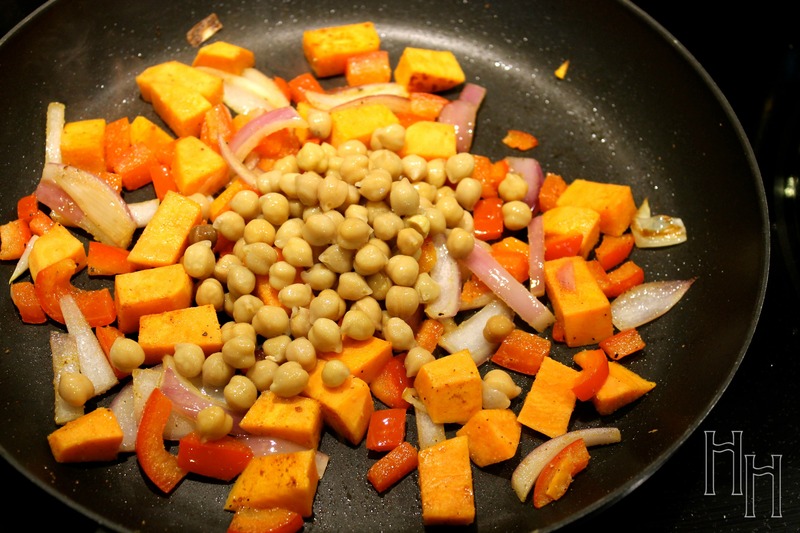 Once your onions have become transparent and your sweet potatoes are still a bit tough, add in the chickpeas and spices: cumin, garlic powder & paprika. Stir mixture together until the spices coat everything lightly. 3. Turn down the heat to low and add the 2 tbsp of water. Cover your pan with a lid and let it steam away for 3-5 minutes (or until the sweet potatoes are tender to fork). 4. While you’re veg is steaming, bring a small pot of water to a boil. Place you egg into a coffee filter by placing the filter into a glass and cracking your egg into it. Carefully place it into the boiling water and hold it there for 5 seconds. Turn stove down to medium/high heat and let it float away! 5. 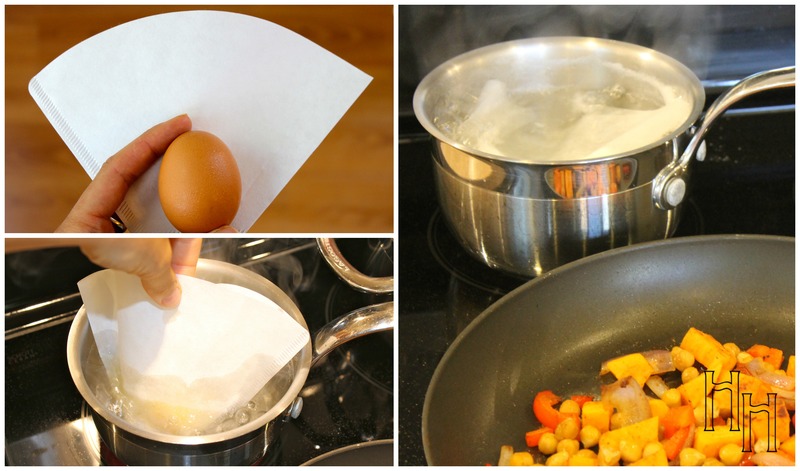 Let the egg poach in your coffee filter for 3.5-4 minutes (Watch it carefully!! Don’t over cook your baby). What’d you think of this hardy dish? Try it out and let me know in the comments below!